Sorry, I missed that at the end of the initial post. That looks to me like some settings have been quite badly damaged. If it were mine I would be inclined to uninstall it, make sure anti-virus was turned off, and then reinstall the software. ??? If the Shortcut in the Start Menu works and the one on the Desktop doesn't. I would just delete the one on the Desktop and Copy/Paste the one from the Start Menu. The start up Home page does not work no matter where I try to start it from. So far the individual programs work from the start all programs. I have uninstalled it several times and reinstalled it with Virus protection shut down but it's the same, no changes. 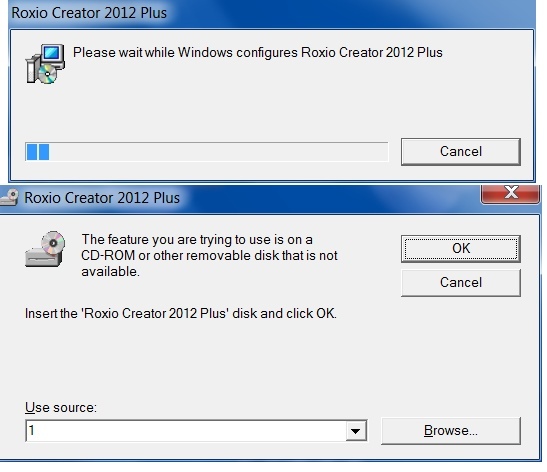 Now go to START--All Programs and cursor down to Roxio Creator 2012 listing and RIGHT click on it. When the drop down menu appears, click on SEND TO, then DESKTOP (CREATE SHORTCUT). The start up Home page does not work no matter where I try to start it from. This is the Menu Application in Creator 2012. Is this what you're calling the Start Up Home Page, and is it the thing you can't get to run at all, no matter how you approach it? If that is so, it confirms my suspicions in post #4. Since a simple uninstall/reinstall hasn't fixed it, the next recommendation has to be to completely nuke the installation and start afresh. -Uninstall your Creator Plus the usual way. -Then download the free trial of Revo Uninstaller, and run it in Moderate mode to remove all the fragmentary traces of Creator Plus. -Restart the machine with Internet and Anti-Virus. This will give you the best shot at getting a clean install of Creator Plus. Yes, in that case follow Brendon 's instructions and you should be up and running as intended!